Utilizing an inventory control system from Wm. F. Hurst Co., LLC, at your business is one of the best ways to optimize your company’s processes and save money at the same time. One of these systems can improve inventory turns, provide better inventory management solutions, increase efficiency in order tracking, and even help reduce operating costs. At Wm. F. Hurst, we offer state-of-the-art inventory control systems from CribMaster, the leader in inventory management and industrial tool vending solutions. Whether you operate a large manufacturing facility or a smaller company that depends on industrial tools and supplies in day-to-day operations, having a CribMaster inventory control system in place can significantly aid the ability to operate at peak efficiency. The knowledgeable staff members at Wm. F. Hurst have years of experience with CribMaster products, and we even have an in-house expert who specializes in tool vending and integrated supply solutions. So, you can rest assured that we can answer any questions you may have in regards to the systems and even help troubleshoot any issues that arise. Contact Wm. F. Hurst today if you are interested in obtaining a CribMaster inventory control system for your business. 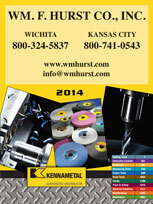 We proudly serve companies in Kansas City, Wichita, Dallas, Fort Worth, and many other cities throughout the Midwest.